In autumn 2007, 37 years after SOS Children's Villages Ghana was founded, heavy rainfalls caused terrible flooding in the north of the country. Once more, SOS Children's Villages was there to help. An emergency relief programme was initiated in order to protect vulnerable children and their families. The Republic of Ghana has a total population of around 25 million and its capital and urban centre is Accra. English is Ghana's official language, although many other local languages are widely spoken. Ghana was the first nation in Sub-Saharan Africa to achieve independence from its colonial power. When Ghanaian leader and Pan-African hero Kwame Nkrumah was ousted in a coup in 1966, a long period of military rule began. A new constitution was approved and multiparty politics were restored in 1992, ushering in a period of democracy. When compared to many other countries in the region, Ghana has managed to largely escape the ethnic and civil wars that have plagued Western African nations. With a relatively high rate of economic growth and political stability, the country has become attractive to foreign investors. Ghana is one of the largest cocoa-producing nations in the world. The commodity is exported to many European countries and to North America. In 2007, a large oilfield was discovered. It is expected to play a vital role in the country's economy. However, according to many experts, Ghana could now face a phenomenon that has affected many other nations where valuable natural resources have been found: the "resource curse". Oil has brought only conflict, corruption and international pressure to these countries instead of increased levels of wealth. The UN Human Development Index ranks Ghana among the top 20 African nations. Ghana has been the most successful country in the region in terms of reducing extreme poverty and achieving economic growth. It has made remarkable steps towards the reduction of poverty according to the UN Millennium Development Goals (MDGs). 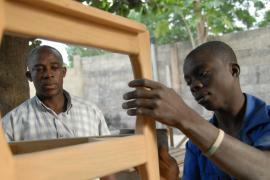 Nonetheless, nearly 28 per cent of Ghanaians are still living in poverty. Although the situation has slightly improved over recent years, at 1.8 per cent, Ghana's HIV prevalence rate is still roughly 20 times that of Germany. 260,000 Ghanaians are affected by the disease. Many of them do not receive proper anti-retroviral therapy because of financial constraints or for fear of being discriminated against and stigmatised by other members of society. The poor parts of Accra are marked by extremely high levels of violence. At birth, the average Ghanaian citizen has a life expectancy of roughly 65 years. In rural Ghana, where high levels of extreme poverty are omnipresent, around 20 per cent of the people do not have access to clean drinking water sources. Decent sanitation facilities are also scarce. Ghana is, demographically speaking, a very young nation. Nearly 40 per cent of the country's population is under the age of 14. However, the hardships that many young Ghanaians face are overwhelming. 27,000 Ghanaian children of this youngest population segment are living with HIV. Around 160,000 Ghanaian children have been orphaned due to AIDS and are now facing a life without their biological parents. At present, an estimated 1.1 million children in Ghana have lost either one of or both their parents. In Accra, thousands of young children and adolescents sleep on pieces of cardboard in doorways, parking lots and bus stations. They beg for money, sell merchandise or engage in petty theft in order to survive. Approximately one third of them are only 10 to 14 years old. The vast majority of these children do not go to school. 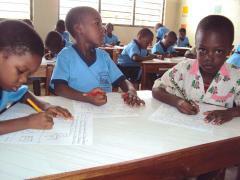 Thus, it is not surprising that 7 in 10 Ghanaian street children are illiterate. Some of these children have run away from their family, trying to escape domestic violence and abusive environments. Without a family to take care of them, there is a high risk that they end up in a vicious circle of poverty, drugs and homelessness. Although Ghana has seen more economic growth than most other countries in the region, thousands of its youngest citizens have not been able to fully benefit from the progress their country has made. The primary school enrolment rate for Ghana is roughly 80 per cent, which means that around 20 per cent of Ghana's children are deprived of a basic level of education . 34 per cent of Ghanaian children engage in child labour activities, many of them do so during the hours they should spend at school. Ghana is also marked by a relatively high infant mortality rate of roughly 49 deaths per 1,000 live births. Nearly half the births in this country are not attended by skilled medical staff. A Ghanaian social worker was moved by the sad fate of children being cast out by their families for reasons of traditional beliefs and decided to take action. During a visit to Norway in 1967/68, she found out about the work of SOS Children's Villages. She then contacted Hermann Gmeiner, the founder of the SOS Children's Villages in Austria. Our organisation started working in Tema in 1974. In Ghana, the organisation supports local children and young people by providing day care, education, medical assistance and vocational training in four different locations. When children cannot be cared for by their families, they can find a loving home in one of the SOS families.